We work with you to plan a maintenance schedule based on your equipment needs. We review all aspects of your equipment to help you maximize safety and efficiency in your operation. By implementing a regular maintenance program on your gas powered forklift truck(s) you will save many in many ways. Including catching oil leaks early before major damage is done, keeping your lift trucks running during your most crucial periods of activity. 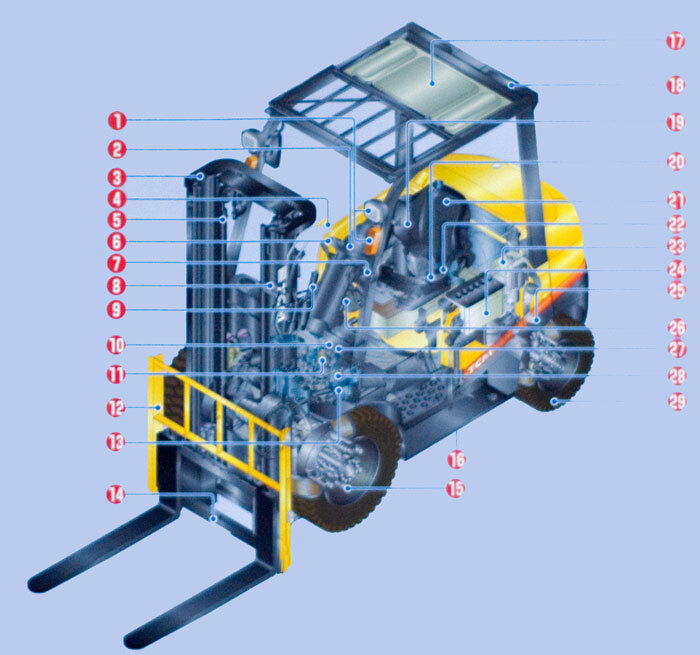 We provide you with a comprehensive 29 point maintenance and inspection program for your Gas Powered Lift Truck(s). Forklifts have many parts that need to be regularly maintained in order to run efficiently and safely. Many of our competitors only look at the major service points and parts. JJ Clark inspects and maintains them all for you on a schedule that fits your particular needs. Below is a diagram of the many points of maintenance we feel are neccessary to keep your gas powered equipment in top running form. We know the unique needs of busineses and organizations like yours in the areas surrounding Philadelphia PA, because we have been serving the community since 1976. Making sure your operation is running smoothly and efficiently brings us great pride. J.J. Clark Inc. All Rights Reserved.